This month’s issue of the Oregon Association of Nursery’s Digger magazine includes the second part of a two-part article on urban foresters’ perspectives on nursery stock. It was interesting to note that some urban foresters felt they were in a quandary because their specs require removal of burlap from B&B trees, yet many nurseries will void their warranty if burlap is removed from the root ball. Removing burlap from B&B trees is a practice that is widely recommended, yet there is little, if any, data to support it. The logic, of course, is that burlap will prevent root egress into the surrounding soil after planting. But is this really the case? We conducted a study a couple of years ago using 3” caliper B&B green and white ash trees as part of a trial on the movement of a systemic insecticide (imidacloprid) for treatment for emerald Ash Borer. Since we were using radioactive carbon-14 as a tracer, safety regulation required us to keep the trees contained. The trees were dug with a 36” tree spade and placed in burlap-lined wire baskets by a local nursery (Discount Trees. Inc.) using their standard procedures. 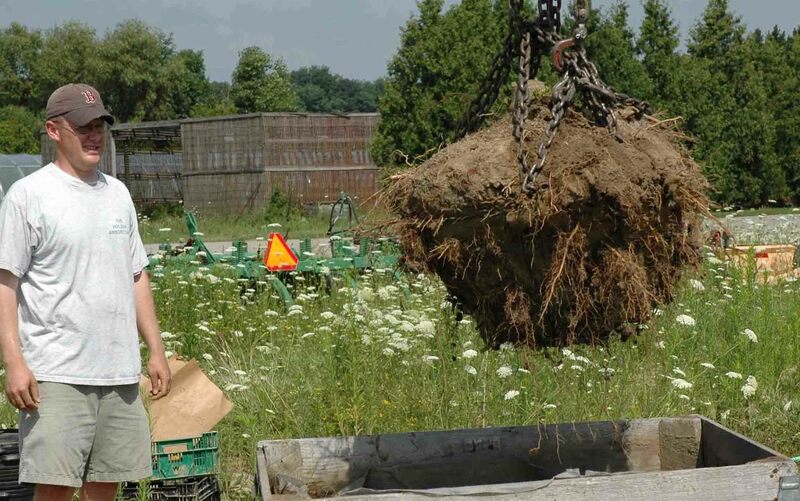 For the study we placed the root balls in large orchard boxes backfilled with top soil. We removed all ropes and the top of the burlap. The trees were used for a study that lasted two growing seasons. At the end of the second season we conducted whole tree harvests on a sub-sample of the trees. My vision for the root system harvest was that we would simply chain up the baskets and pop the trees out of the boxes; the burlap would help contain the roots, right? Wrong. Separating the root balls from the boxes became a major ordeal that involved a whole lotta shakin’ with the front-end loader. Once the root balls were finally extracted it was obvious that the burlap provided little resistance to root egress into the surrounding soil. Mike Kuhns at Utah State University conducted a trial several years ago (J. Arbor. 23:1-7) in which he observed a similar phenomenon. Mike compared root egress of B&B maples with burlap removed versus a single or double layer of burlap by calculating a RTRATIO which was based on the amount of the total root system weight that was found outside the original root ball. There was no difference in the RTRATIO between trees with single burlap and trees without burlap at any date during the 2-year study. Double burlap decreased RTRATIO initially but there was no difference by the end of the study. Annela et al. (Arb. & Urb. For. 34:200-203) compared various growth parameters of baldcypress, plane tree, and freemani maples transplanted bare-root or B&B with only the top of the burlap removed. After two years the only statistically significant difference was an increase in shoot growth for the B&B maples. So what does it all mean? My personal opinion is that when it comes to establishing trees in the landscape we spend way too much time worrying about trivial matters like this. (Digging a planting hole 3X the width of the root ball and amending backfill are others but we’ll save those for another post). Matching species to site, quality planting stock, and proper after transplant care – especially mulching and irrigation – are way more important but still neglected. If we plant quality plants in the right place and take care of them properly the first two years after planting we would eliminate 80%+ of the transplant issues I see. Burlap or no is a tempest in teapot. Love the post! But I'm curious, in the above experiments was the burlap treated? If so with what? Also, what are your opinions about removing vs. leaving the wire basket? You know, I'm not surprised that you didn't see much of a difference in the study. The burlap isn't the big problem – it's the buried root crown and poor roots. So I guess I'd have to agree. If you're not going to wash off the clay, correct roots, and plant at grade, why bother taking off the burlap? So in an odd way, we all agree on this! Bert didn't leaving the burlap on for several years, as is often the case in nurserys. Linda has pictures of burlap where a new covering was put over very old burlap. When kept in burlap for years the soil adheres much higher than the root crown, and the roots start to grow together and around. Actually, soil above the first main order roots is usually due to cultivation practices in the nursery during production. Over a few years these practices deposit extra soil over a tree's roots. After a tree is harvested with a tree spade, but before the tree is "sealed" into the burlap and wire a responsible nursery will remove the soil above the roots so that it is no deeper than an inch or so (technically, when measuring the size of a ball, the depth of the ball only goes from the base of the ball to the uppermost roots). I've certainly seen rebagging — but it's just not that common — at least not here. I've got to say that the more I hear the more I think that I must live in some kind of nursery heaven. Our growers here in Minnesota, and the Upper Midwest in general, are usually very responsible and responsive when problems are discovered. I agree, Jeff – you live in nursery heaven! (I should also mention that the few local production nurseries in Washington that I've seen have decent practices.) Thanks for the clarification on how the bagging works. I'm not conversant with production nursery practices – just the results of bad ones! Couple of points of clarification. We weren't comparing burlap vs. burlapped removed – that was Mike Kuhns' study. I included the photos from our imidacloprid study to further illustrate that burlap is not an impediment to root egress form the root ball; which is a common misconception. Also for the tree on the photo we removed the top-most ring of the basket at planting so we wouldn’t encounter any wire during any of our procedures with the trees. The trees were planted at grade – we had to dig down with shovels to find the baskets in order to hoist the trees out so it looks like they were planted deep. The trees grew great and we had tons of new roots in the backfill. I wouldn’t say we live in nursery heaven – there are certainly issues out there – but a large number of our nurseries are long-time, often multi-generational businesses. In terms of transplanting issues I deal mainly with professional landscape contractors, arborists, and urban foresters. Most of these folks deal with significant numbers of trees and have been around the block a few times. If they’re getting crap from a nursery, they’ll get the trees replaced and if it’s a continual problem they just don’t go back to that nursery. I’m not naïve about installation issues – I have my chamber of horror shots of unbelievable planting jobs as well. Unfortunately, most of those contractors aren’t at the professional trade shows attending our seminars or reading this blog. Aside from pest/pathogen problems, I would say 70-80% of the tree problems I see are species/site related (road salt, grade changes, poor drainage), 10-15% installation and 5-10% poor nursery stock. It doesn’t matter how well you plant a white pine along I-96 or how good the tree is, after two winters it will be dead. Pat has a valid point, too — some trees do get a second bagging, and then the roots have to work to get beyond that burlap as well, which would seem to slow post-planting establishment. Did your research trees show growth of larger roots through the burlap, or mainly only feeder roots? Was the soil compacted in any way? When I think of a tree planted in an urban tree pit, I think of the compaction the surrounding soils undergo (and the resulting reduction in pore space and oxygen availability), and wonder if a burlap wrapping under those conditions would really permit the same kind of burlap degredation and root penetration that you saw. We just finished root washing 7 good sized conifers and one plum on Saturday (purchased from one of the better retail nurseries in Seattle). All had good crown structure. However, of the 6 that were B&B, all had burlap and clay from 2-6" above the root crown. All had adventitious roots growing from the trunk into the clay around the trunk. All had been placed in container media with varying levels of root penetration (fine roots only – no woody roots). All were bound with nylon twine (which doesn't degrade). Two had serious circling woody root issues. One was obviously a hardwood cutting – with no true root crown – rather than grown from seed or softwood cuttings. The most interesting thing was that all had been outside in the rain so that the container media was soaking wet. Yet the clay inside was dry as a bone. I remain convinced that the best way to (1) plant the root crown at grade, (2) correct root flaws, and (3) remove all the textural barriers to water and root movement is to root wash.
Next Next post: The joys of arborizing!